The new prompts are sleeker and have a timer on them to auto-deny the request after 60 seconds. Through the new action popup list it should now also be much clearer how an application can be added to the ignore list from the prompt itself. 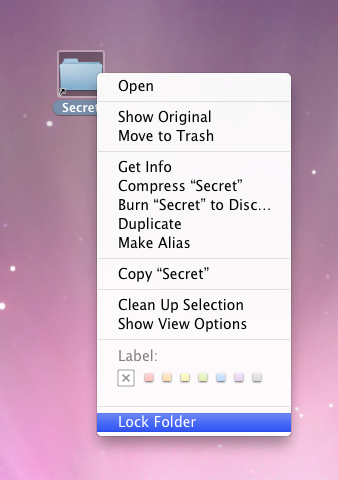 Return of the Contextual Menu Item! After updating to Espionage 2.6, you must restart your computer before it appears on unlocked encrypted folders. 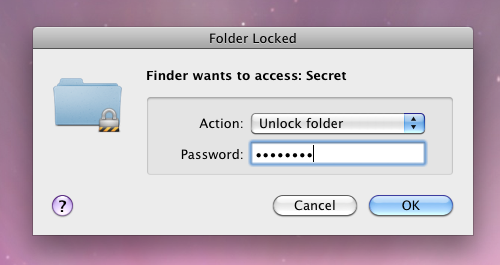 Currently, this item will not appear on unlocked non-encrypted folders, though this may change in the future. TrialPay – Get Espionage Free! We’ve added TrialPay as a payment option to our new order page, which means you can get Espionage free by completing an affiliate offer. I’m unable to play the video?! Hi Clif, we’ve tested the video on Firefox, Google Chrome, Safari, and the iPhone. It plays just fine on all of them as far as we can tell. I’m using Firefox 3.6.3 and Safari 4.0.5 (devoid of any addons) on OS X 10.6.3. You can view a screencast of my issue at http://www.screencast.com/t/MTg2NDYyZWQt. I asked on twitter whether others were experiencing this issue and the consensus was that everything is fine. From your screencast it seems like it may be that something is blocking the video itself from showing up, this could be either a plugin (which you say you don’t have), a firewall on your computer, or somewhere up the line (whoever is in charge of your internet connection).